With Facebook rolling out functional hashtags, I’ve seen quite a few people question what, exactly, they are. Some are even asking if they’re still a viable “feature” in the evolving world of social media. So, today, let’s break it down. Hashtags are, most simply, metadata. That is, they’re data about your data. It’s descriptive text that tells a story about the context of a piece of information. In the world of publishing, for example, metadata includes information about your book – length, binding, trim size, author bio, and more – that will be used by booksellers like Amazon to categorize your book and see it listed properly for sale. In social media, hashtags provide a clickable way to catalog your message, photo, or post. Whether you’re labeling your latest tweet #lunch, tagging an Instagram photo #gopy (gratuitous picture of yourself), or providing commentary on a political scandal with #GOP or #DEM, the moment you hashtag your message, it becomes part of a larger, searchable conversation. People who click the link in your Facebook status or Pinterest pin will be able to see a running list of all the other messages that have the same tag. When breaking events are taking place, it’s easy to use Twitter to follow along with developing news, opinions, and eye-witness reports as people quickly gravitate towards just a few hashtags to catalog the experience. When the Boston Marathon bombing took place, many news sources found photos via Instagram using hashtags and – during the manhunt for the bombers – many people in Boston took to the Internet to update friends, family, and strangers on what was going on from within the locked down portions of the city. There’s more to hashtags than breaking news, though, They’re also used as community-building and marketing tools. With wide-reaching groups of PhD students, moms, gamers, and so much more identifying a single hashtag to communicate with their community as a whole. With a single tweet, you can gain the attention of members of your community from around the world, engaging in conversations about hobbies, studies, professions, and life in general. 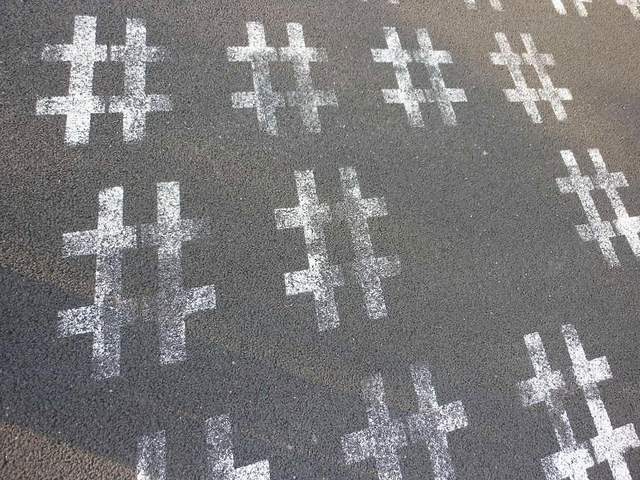 Many companies adapt hashtags as a means to engage with their audience, as well. Earlier this year, Target launched the Everyday Collection campaign, where they collected tweets about popular products and filmed runway models reading them as they displayed Target goods. The campaign was a wild, hilarious success that leveraged Twitter and YouTube for a cross-platform marketing endeavor that people loved to watch and participate in. As writers, how are you using hashtags online?